First game. Great date. Team-themed party. Company outing. 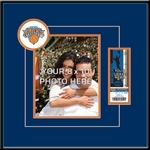 What ever the reason, this 4x6 picture frame can be personalized with up to 24 characters of text. 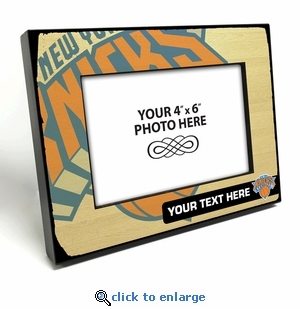 Featuring a team logo'd wood graphic adhered to a 1-inch thick wood frame with black edges. Includes a glass photo cover and hinged easel back for easy display. Overall size: 6" (H) x 8" (W) x 1" (D). Officially licensed by the NBA. Personalization Ideas: Lexi's First Game. Dave & Amanda. 2017 Road Trip. Happy Anniversary. The West Family. Etc.